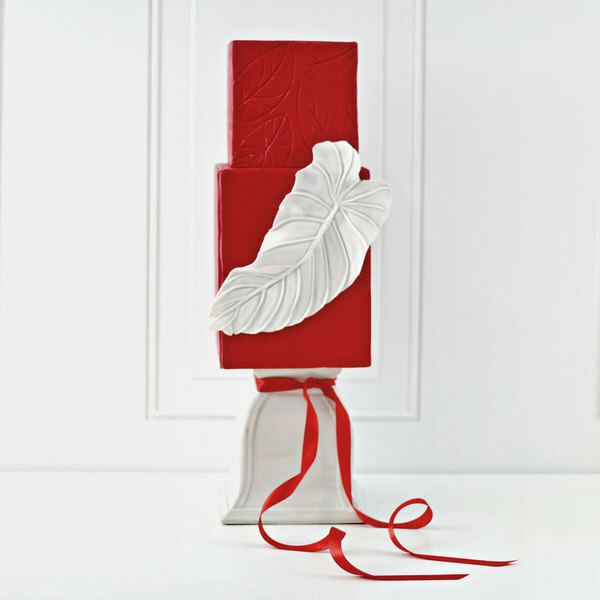 Transform your cakes into elegant culinary creations with this Satin Ice 10019 red vanilla rolled fondant icing! This fondant is perfect for covering wedding cakes, birthday cakes, and custom novelty cakes with a satin-smooth finish. It enhances any dessert with a classic red color and a sweet vanilla flavor that does not overpower the taste of the cakes, cookies, and pastries themselves. Extremely versatile, its dough-like consistency can be molded, twisted, shaped, and sculpted into decorative flowers, bows, and character figures. Although I'm personally not a fan of the taste (besides their dark chocolate fondant which is amazing!) 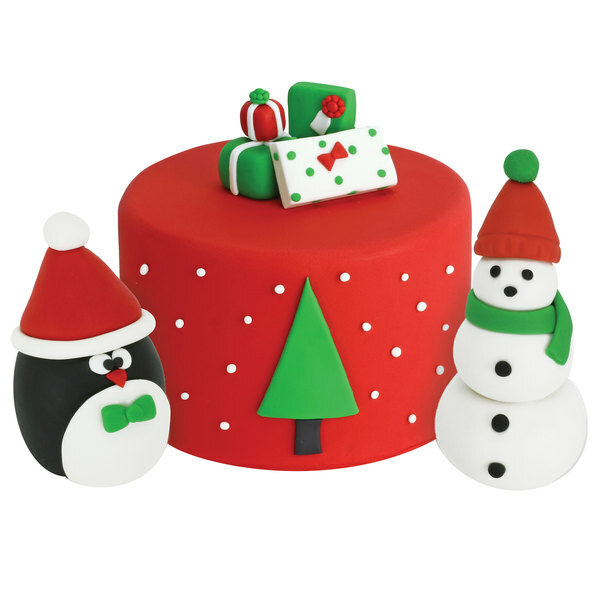 This fondant is smooth and pliable and rolls very easily. Would buy again. Love this product! And you cant beat the price of it. Definitely get a bang for your buck when you buy in bulk. Helps alot! 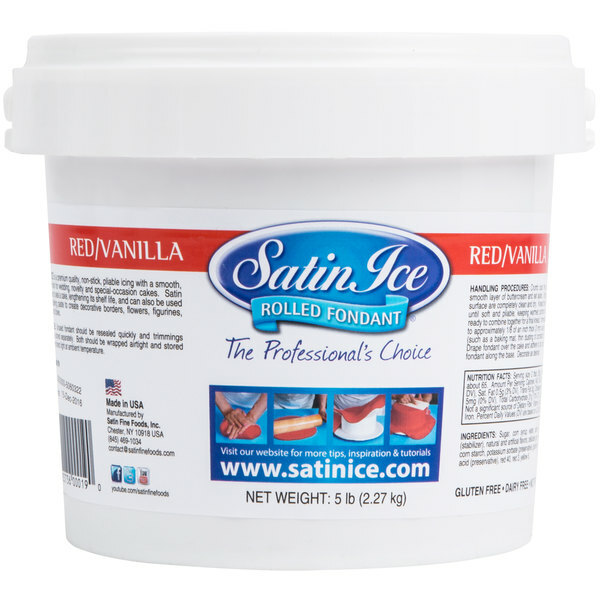 We love satin ice red fondant! We hate dyeing our own red, its so hard and never gets this true. It rolls out amazing and doesent crack when working or forming. Perfect for all aplications and makes amazing flowers. This red fondant is very nice and bright..and has good taste.. 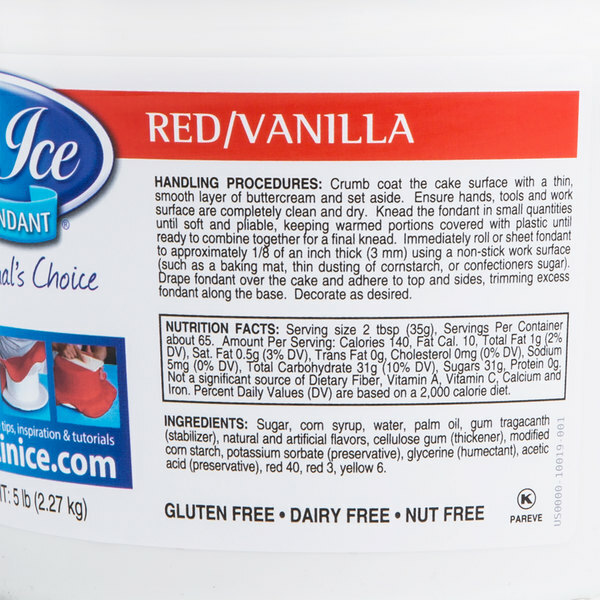 I'm using for many cakes and cupcakes...it works really well ..I prefer satin ice..for my cakes. I love how vibrant the color is and no bitter taste! Easy to work with and holds up well to the heat in my country! Totally impressed. Will definitely buy again! A perfect red fondant. It's a vibrant and beautiful shade and you don't have to add anything to it. It's so easy to use and it doesn't have that nasty flavor red colored fondant usually has. 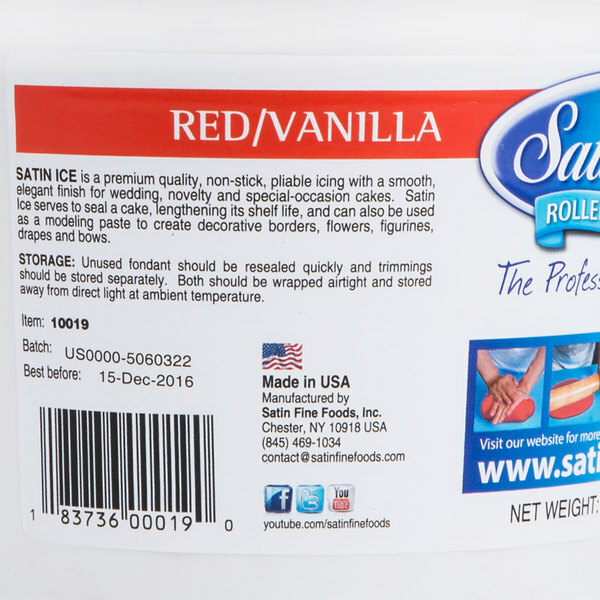 The Satin Ice red vanilla rolled fondant is awesome and tastes great. The red color is awesome and its perfect for make hearts and Christmas cutouts. This is such a rich red color and is so easy to work with compared to Wilton and homemade fondants. It's not stretchy and doesn't get the "elephant skin" type cracks like other fondants. I will never use anything but Satin Ice again! This price on this site is fantastic!!! Satin Ice to the rescue. 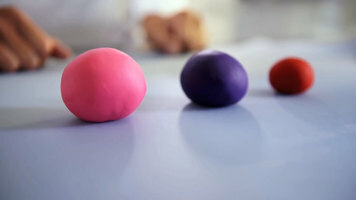 Red fondant is very difficult to make by adding red color to the basic fondant and any fondant made using this method tastes very bitter. But Satin Ice red fondant not only has the fire engine deep red hue but tastes great as well. It can be easily stretched to cover large surfaces with no tear. I love the bright red color of this fondant. It's so great to purchase fondant that already has that true color so you don't need to mess with gel food coloring and trying to get that bright color that's so hard to achieve. My vanilla red fondant is the perfect red. It truly taste good and covers the cakes good with no cracks. I will order this again. Best fondant I have found! The taste is great! Kids actually like it! And it is so easy to work with!! Just the right softness for rolling!!! Great bright red fondant. So much easier than tinting your own. Sometimes it can be a little streaky but just keep kneading and it will smooth out. Satin Ice fondant was so easy to work with. Just knead and add a bit of powdered sugar on surface prior to rolling. Color is exactly as shown on the tub. 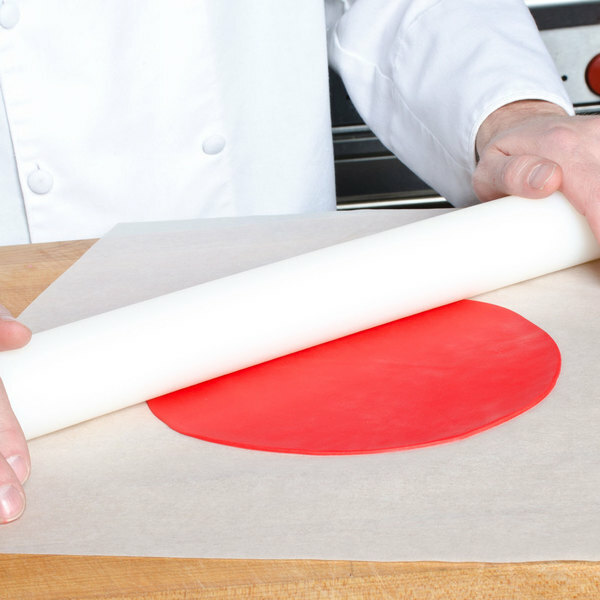 A super bright red fondant that is great for making our heart cut outs for our cakes. The fondant rolls out great and does not tear easily like some brands. The red is colored perfectly and worked amazingly for our firetruck cake. The fondant has a great vanilla flavor and is very easy to handle.